Baking soda is an inorganic salt often found in powder form. It is used in baking as a leavening agent since it releases carbon dioxide when it reacts with acid or heat. It is also used in wide range of non-food products, such as laundry detergents and personal care items. 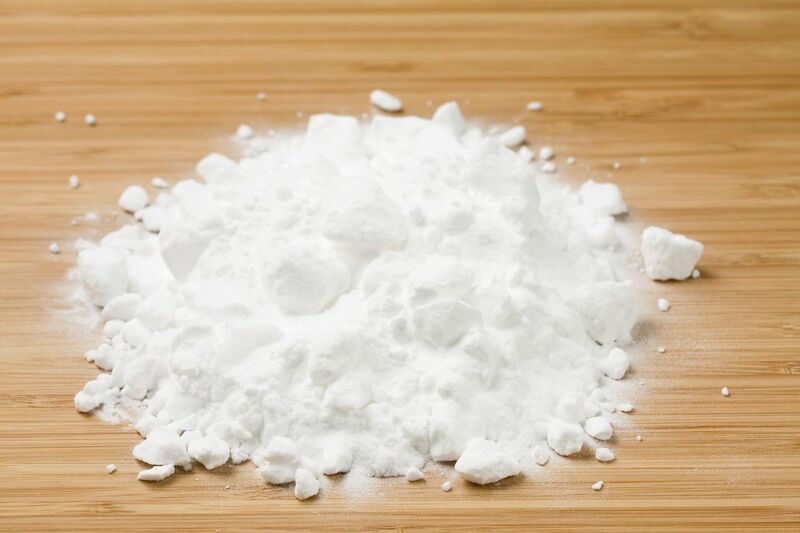 The molecular formula for baking soda is CHNaO3 and its U.S. Pharmacopeia (USP) registry number 144-55-8. Baking soda may go by the following names, which might be how it is listed on a product label: acidosan; carbonic acid monosodium salt; bicarbonate of soda; meylon; neut; sodium hydrogen carbonate; sodium acid carbonate; sodium bicarbonate; sodium hydrogencarbonate. Very alkaline in nature with a high pH, baking soda is one of the top eco-friendly cleaning ingredients and is used in several cleaning products, especially green cleaning ones. You can find it in laundry detergents, cleansers, mold control products, cleansers, carpet fresheners and cleaners, dishwashing soaps, automatic dishwasher detergents, air fresheners, toilet bowl cleaners, floor cleaners, all-purpose cleaners, and stain removers. It's known for its fantastic deodorizing, whitening, brightening, cleaning, and gentle scrubbing abilities. Due to its powder form, it's also great at absorbing grease and spills. In addition, it has bactericidal and stain removing abilities as shown in one dental care study published in the Journal of Periodontology and another in the Journal of Clinical Dentistry, respectively. If it can work on your teeth, it definitely will work on other surfaces, too. You can also mix up your own green cleaning creations with it in no time at all. In addition to its use in cleaning products, baking soda can be found in several products, such as personal care products (e.g., bath products, toothpaste, deodorants, cleansers, soap), drugs (e.g., skin treatments), baked goods, and cat litter. Baking soda is also taken for heartburn, acid indigestion, and upset stomach resulting from such problems. In addition, you can use it to adjust the pH of your swimming pool. According to the Environmental Protection Agency (EPA), baking soda is also considered a biopesticide, which are pesticides derived from certain kinds of natural materials. Aside from baking soda coming in the familiar Arm & Hammer box, baking soda is found in several other products as an ingredient. To see if certain products contain baking soda, try searching the U.S. Department of Health and Human Services Household Products Database, the Environmental Working Group's (EWG) Guide to Healthy Cleaning, the Good Guide, or the EWG's Skin Deep Cosmetic Database. Remember, if using the general term "baking soda" doesn't generate a lot of results, try entering one of its synonyms. When baking soda is used in personal care products, food, or drugs it is monitored by the U.S. Food and Drug Administration (FDA). For other uses, such as pesticides and cleaning products, it is monitored by the Environmental Protection Agency (EPA). Unlike some other chemicals used in cleaning products, baking soda is a pretty safe chemical. You can even take it internally as an antacid as noted right on the Arm & Hammer baking soda box. However, the directions warn that the baking soda should be completely dissolved in water first and not taken when you're full. The only real safety concern with baking soda is that it can cause eye irritation and redness according to the International Chemical Safety Card (ICSC). Flushing the eyes with water for several minutes and then seeing a doctor is recommended if it gets in your eyes. Other than that, baking soda is very safe. No data shows baking soda to have negative environmental effects. However, it is indeed mined from a material called trona, which is found in Wyoming, and then processed into baking soda. The environment is impacted by the mining and processing.